One point of clarification - to my knowledge and based on the rumors I've read, there will be two 6 core releases, one 8 core release, and one 10 core release. Has there been new information stating that there will be two 8 core models rather than two 6 core models? I still think we'll see the 10 core at $1099, 8 core at $899, and the 6 core models at roughly the current prices of the 5820K and 5930K (roughly $400 and $600), though I wouldn't be terribly surprised if the 10 core is bumped to $1199 with the 8 core at $999. Personally I'm hoping for a $600 8 core model. Seriously though, Intel has no real reason to drop prices on enthusiast chips - by definition, we're enthusiasts and will likely pay for their HEDT products unless the pricing is totally insane. You might say "But they want to sell more of them!" and while that's true, the HEDT market is a tiny fraction of their business and I doubt a pricing drop, unless very large, would have a noticeable sales impact. They have to be careful at the low end because who in their right mind would buy the 6700K if the 6 core BW-E is within $50? That's why I think they'll charge a premium for the 10 core, but it won't be an insane premium to the point where we are looking at $1500. You know, I'm kind of laughing at these prices - I built my first rig in 1995 and bought the brand new Pentium 120 for $999 (which was a good deal) and didn't think twice. How times have changed, as I wrestle over whether to buy the 5930K now for $459 or wait and hope BW-E is a surprise in terms of pricing. The difference is how much Intel is struggling with yield and cost at 14 nm - even now. Which is why it makes a whole lot of sense to keep the pricing scheme as is, while adding a new price tier above $999/1049 for the 10 core. It's just to extract a little bit more money out to make up for things. Ah. Thanks for the clarification if that's the case. nice try but adding another SKU has nothing to with the pricing history. tons of extra SKUs have been added to the mainstream lineup put pricing has remained about the same for the top i5 and i7 cpus. :/ Fine, whatever. I don't know why you guys get so defensive. Won't a significant number of these 8 & 10 core chips be higher core server chips that had faults in the cores above 8 & 10? It's actually even more complicated. 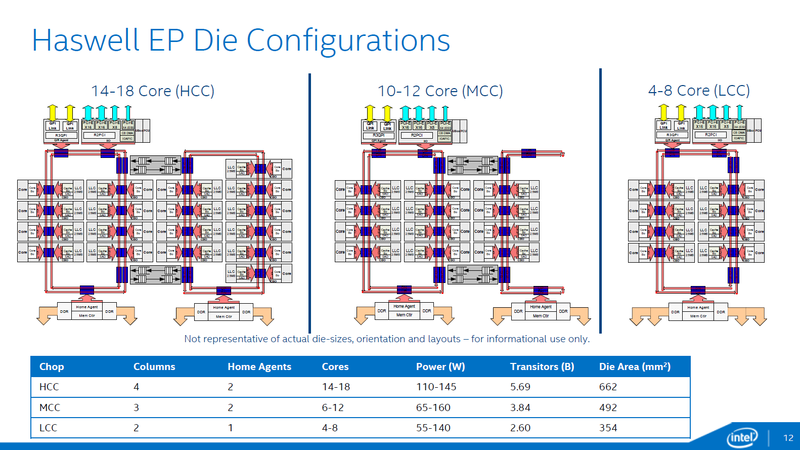 Currently 8 core Haswell-EP come from full die, and there are two more die "configurations" for server. Intel can't easily produce lower core counts from those larger server dies, because they would have different cache latency/BW characteristics? With 10 core Broadwell-EP i think it could be the same, with low core variant having full core and not cut down server ones. There is no loss in disabling cores/cache as such. 10 cores will be the new smallest die. On the price issue: how many of you that are interested in the 10 core version be put off if it were priced at 1299 instead of roughly 1000? I'm interested partly because Europeans pay so much more for hardware than Americans do, and if it turns out to be 1100 Eur here I wouldn't be surprised at all. Even if it was 1299 to be honest but this is what I've grown to expect from niche market high end products. Europeans pretty much pays the same if you exclude VAT. Most Europeans cannot exclude VAT though. My idea is that Europeans are used to paying more for the purchase of x good (I mean, AMGs are more expensive in Germany than they are in the USA...). So, I doubt that someone interested in a 10 core E CPU is sensitive to the difference in price that was being argued about before. I hope to see it on idealo.de for around 1200 EUR. I bet it'll be around EUR 1500 day of release even if Newegg or Microcenter have them for around USD 1100. But, would the people in this thread committed to getting one only buy it if it's close to USD 1000? I bet not. And I'd be surprised if Intel doesn't try to gouge a bit, despite the historical precedent being cited. A higher price would have to include VAT as well. And you forget wages and other costs. The US market is very small for Intel. The European close to as small too. If you want to set a global price, its done via Asia. In short, it doesn't matter what Americans and Europeans are willing or not willing to pay. Intel have kept the X price steady for a real long time. I am sure they also did plenty of research on what is the optimal price/volume/profit ratio. The price speculation I'm putting forward includes VAT because people in the EU pay VAT - and you, one of the higher end VAT payers. And I don't 'forget wages' or 'forget costs' - I'm simply saying it's more expensive to buy the CPU in Europe than it is in the USA - period. Forget my theory. To put it clearly: people who are willing to spend USD 1000 on a CPU are probably not going to mind much if that price is shifted to USD 1100 - this is about elasticity of demand. So I don't understand why Intel wouldn't raise the prices this time around, unless it really is so important to them that they maintain fairly consistent pricing around their E chips generation after generation. But I'd be delighted if the historical precedent you cite holds. I think you are confused. There are two 6c's and 1 8c. Not the other way around. No way 8C is going to cost 900$ I think it's going to end up as a 600$ SKU. 900$ would make it totally unattractive compared to the 10C and not much of an improvement over the old 5960X. For 600$ I think I'm going to buy one, no way I'm going to pay 900$ for one I'm also not going to pay 1000-1100$ for the 10C SKU because I don't think I can make use of 10 cores/20 threads. Personally I would have preferred 6C/12T 128MB l4 SKU to that 8C SKU but that's not going to happen. After realizing they are late to the game with mobile and seeing the casual desktop user dying they are finally catering to the overclockers and enthusiasts eh? Frankly I see that as a bad sign. I would love to get a 6-8 core chip for less money but won't that hurt their server revenue? I'm sure they've got people in there who've ran the numbers and see where the good balance would be in price. After skipping the 5820K and skipping the 6700K, I await Broadwell-E. Hopefully they use solder and not thermal compound between the processor and the IHS, or I'm skipping it. ECC is essential for running a server, so that's not really a problem. It's launching during Computex 2016 (May 31st to June 4th). They say the 6950X is going to retail for $1000. Anybody who bought a Haswell-E at launch really got a great value. About 2 years of having the best desktop CPUs on the planet. Yep, my 5820K has been an awesome chip. I can't wait to grab a 10c Broadwell-E to replace it. I'm hoping we'll hear some details about the X99 board refreshes in a couple of months. I'm assuming just about all of them will come with USB 3.1. I may just go ahead and jump on a 980 Ti and then do the BW-E upgrade in August or so (I'll let you guys be the guinea pigs. ). I'm assuming just about all of them will come with USB 3.1. Hope, it won't just be an add-on bracket. USB 3.1 G1 or G2? The refresh will most likely be more about M.2 and U.2.